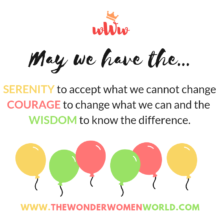 I started with my blogging journey few years back and once I started becoming more regular and a little bit known I started getting invited for events. The small-town girl inside me was excited and star struck when I got a chance to interact with a celebrity for the first time. It was unbelievable! In those events, I met a lot of like-minded women, many of whom are my friends today. We were raw, real, started blogging which was still kind of new in those days. We were happy to connect, to share, to motivate, to learn from each other. We still continue doing so. But over the years I can see a lot of “fake-ness” around. With evolution of better and “smarter” phones, somewhere the relationships are also getting more and more edited and air-brushed like the photos. Over the years I have learnt that not everyone who smiles, praises or claims to be your well-wisher and friend is really a friend! 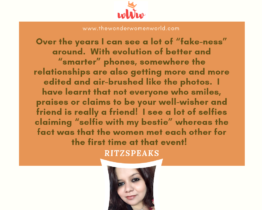 I see a lot of selfies claiming “selfie with my bestie” whereas the fact was that the women met each other for the first time at that event! Let’s stop using and abusing the word friendship. Let’s stop being fake. Let’s get more real. Let’s not air-brush or edit the relationships like the photos. Let’s stop using people for selfish interests. It’s not necessary that we should like everyone, or we gel and bond with every person we meet. We can be cordial, give a smile and that’s it! Let’s take photos and selfies for memories. Let’s simply savour the moments and enjoy the discussions without trying to only concentrate on trying to pinpoint people who could be of our “use”. Remember life before selfies or social media? Sometimes, it’s good to get in that mode, what say?